Oh What A Year It Has Been!! 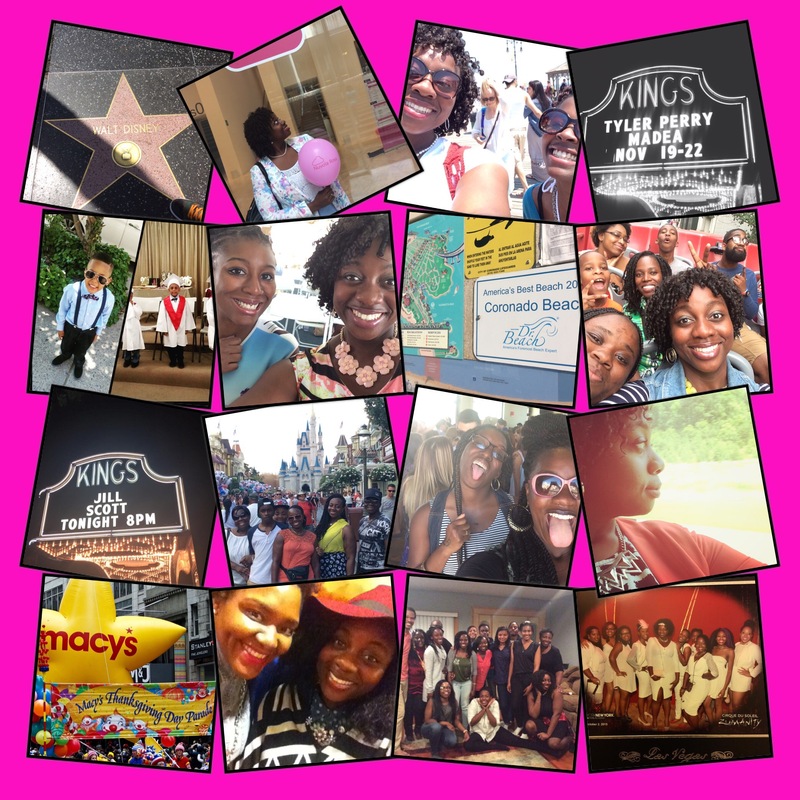 2015 In Review! Wow!!!!!! I cannot believe that it is here already!!! I remember New Years Eve of 2014 like it was yesterday! This year has been something! My Oh My! A year of bliss, adventures, love lost, love found, confessions, mistakes, “oops I did it again’s”, interviews, opportunities, emotional highs and lows, laughter, incredible joys, new births, lots of traveling, happy and sad tears, self-discovery, experimenting, and sooooooooooooooooooooooooooooo much more! As I reminisce on this year, I would like to give God allllllllllllll the credit for making things possible and for seeing me through it all. He made me realize that the very things that I thought I was ready for….weren’t ready for me! I asked the Lord to show me ME this year and He did JUST THAT!!!! DUDE…It was scary and fascinating at the same time and God is still revealing things in me and to me. Here’s a list of a few things that I’ve done this year! I encourage you to look back on this year and do the same! Went back to grad school for Social Work after taking a semester off! Went to Cali for a job interview near Rodeo Drive(How cool is that?…but I didn’t take the offer because it wasn’t offered to me! LOL) . After the interview, I spent time with family and went to Disney Land for the first time…went to Hollywood, and stayed at the Huntington Beach Resort! PHENOMENAL TIME!!!! Went to Cali a second time for a friend’s wedding! Ahhh Man it was beautiful! My friend and I had the opportunity to cater some of the food! How cool was that?!! Attended my first Indian wedding! Flew from one wedding to the next for #4 and #5 in 24 hours! Was accepted into the Pink Cloud Initiative 3-Day Women’s Empowerment Conference for girls in STEM in Milan, Italy! Created a GoFundMe Account for the Milan Trip, and raised over my goal!!! God is so faithful and I thank those that invested in me financially, spiritually, and emotionally! Celebrated my friend’s 25th Birthday in Jersey! Love You Maya! Received a birthday basket from a friend! Loved It!! Thanks Nay! Went on a random trip to Atlantic City with my boo thang Nay! Went to see the “Madea On The Run Tour” at the Kings Theater! DOPE! Celebrated my grandmother’s 80th Birthday in NC! JessicaCarol-lynPhotograhy did a phenomenal job, taking memorable photos on that special day! Went to Disney World with the fam! Went to NC four times for birthday celebrations and family occasions! Went to DC for a job opportunity/partnership, (I was offered the position but didn’t take it ). Went to VEGAS for my 24th Birthday!!!!!!!!!!!! #10GirlsOnePlace! I am still on the High from it!!!!!!! Ahh man!!! It was wonderful! Went to an all you can eat sushi spot(TWICE) and was treated!!! Thanks Jeaneatte & Red; Thanks Guerrasio Family! My Bestie surprised her sister and I to see the Lion King!! !It was AMAZING! Went to see my friend before her leg surgery! During this time, she started a blog! Check her out at PinkCaboodle! Met up with a childhood friend and will be planning a BIG trip next year!!! Stay Tuned! Hosted a 3-Day Family Reunion in NYC! My Godson graduated from kindergarten!!! GO KESTON! Went to Baltimore to hang out with an Amazing friend! Hey Zippy! My friend Jess surprised me and came up to New York! Surprised a friend and went down to celebrate her 30th Birthday! Haha! So Cool! So Dope! Tried Authentic Indian Food for the first time! Had a few mental breakdowns lol but my BEST FRIENDS came through for me every time!!!!!!! Love you girls if you are reading this! I couldn’t have made it without you! Started my internship as a case planner working for Child Protective Services/Preventive Services! Saw the Thanksgiving Parade at my former Forever 21 job! Perfect view!!! Got started on my YouTube Channel K.CameraReady! Check it out & Subscribe! Went to NC for Christmas to spend time with family! Gained weight!! !LOL thanks to the stress from grad school, Thanksgiving and Christmas! Hugged more than ever before! Started a membership class at a church! Whew!!!! There’s a whole lot more memories, but these are the ones that have impacted me the most!!!! As 2016 is quickly approaching, I would like to say that I am ready for it!!! A New year means a New ME! New opportunities, growth, adventures, and so mucn more! I will talk less and pray/write more! I will laugh more! I will hug more! I will love more! I will dance more!I will speak more positively! I will travel more! I will BE MORE!!! I will accomplish my goals for the year!!! I AM SO EXCITED!!! I want YOU to be excited about your 2016 as well! HAPPY NEW YEAR’S EVE MY FELLOW READERS!! !